Therm-a-Rest Tranquility 6 Awning Poles. Want to upgrade your Tranquility 6 tent to make it even more luxurious? Use these lightweight aluminum poles to prop-up the unzipped door of the Tranquility 6 and create a sheltered so you can relax in style. These poles can also be integrated into our Hammock House to make a covered shelter for storing gear or sitting out a rainstorm. 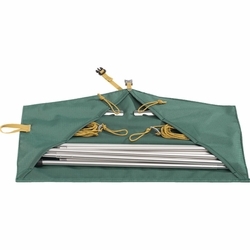 Easy to Use: Props up the tent�s unzipped door for quick and easy awning set-up. Multi-Functional: Lightweight aluminum poles can integrate with other shelters for extra stability.